The autumn break is here. The track went from a Good 4 to a Soft 5 at 11.50 am, and then to a Soft 6 at 12.15 pm. What the hell is a Soft 6? Slow? Or Dead? All I know is that my umbrella is up and that I can’t write in my race book. It means no betting. But I like having a go at the two-year-olds, and so I risk a bet on the good-looking grey, Petracca, before the track gets chopped up. The horse thankfully manages third. Too wet to wander out the back. When I finally make it John the gateman asks how I’m doing. I report one bet for one collect. His advice? “Go home.” That’s good advice! I implement it straight away. The track is immediately downgraded to Heavy 8. I liked Primo Pintxo and Fleur Fatale in the 2YO but pulled the wrong rein and backed the Primo. The fatal flower paid well at $4.60 the place. And I thought Moody’s Runway Star looked a standout, but it was always back and never came on in the ninth. I was feeling a bit desperate before the tenth, but saved myself with Amorino. Ten races with big fields are way too many for regular horsewatchers! A long and difficult day. Home in the dark! I thought I was too old to find another way to lose, but I was wrong. The last race at Headquarters, the get-out stakes. A 2500 metre race for stayers. I’ve got a winning ticket in my pocket from a previous race for Hard Romp. The horse was very relaxed in the yard. The favourite, Ball Of Muscle, lived up to his looks, but was too short at $1.40 the place. Hard Romp was showing $2.90, so it was a no brainer, and no surprise when they filled the quinella. So I’m cashed up for the last. Bryce Stanaway’s old stayer Crafty Cruiser looks the goods, very relaxed, and the Hayes horse, Rawnaq, is not too bad. I’ll go the Cruiser. I’ve backed him successfully on a couple of previous occasions, so I have full confidence. A bet! Suddenly, what the hell is that? “EVACUATE!, EVACUATE!, whoop, whoop, whoop, EVACUATE!, EVACUATE!” The noise of the siren is painful. I stick my fingers in my ears and leave the lawn to escape the noise and have a bet, but the crowd is coming the other way. 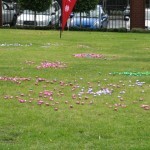 Everyone spills out onto the lawn – punters, gate men, bar staff, tote operators! I’m not allowed into the stand! Maybe it’s a terrorist attack? A bomb scare? A fire in the kitchen? Even if I could get in the tote is deserted. There’s nobody there to bet with! The 2500 metre starting gate is directly opposite the wall of noise. The horses hate it. The start is delayed. Well, you wouldn’t be able to hear Greg Miles race call over the din. Eventually, after some five or ten minutes of infernal noise, the terrorists go home, peace is restored, and the horses jump. You know the rest. The Cruiser cruises down the outside to grab Rawnaq on the line. I hang around for five minutes to cash my ticket, but the tote ladies have deserted the ship. I hate going home with less cash than I started with, but holding a hot ticket, burning a hole in my pocket. Is that a loss? Is failure to win a loss? Will the tote ladies bring back their tills next week? Will they still payout on Hard Romp? 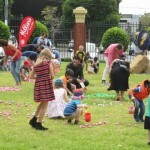 Did the Easter bunny come to your place? 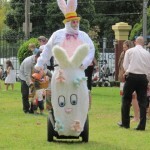 It looks like he left all his eggs at Caulfield!